Our Kiwanis Miracle League provides children and adults with physical or mental challenges a safe and spirited environment where they can hit, run, and catch on a baseball field. Children aged five through eighteen with special needs are welcome. Our adult/senior play is for those 19 and above. 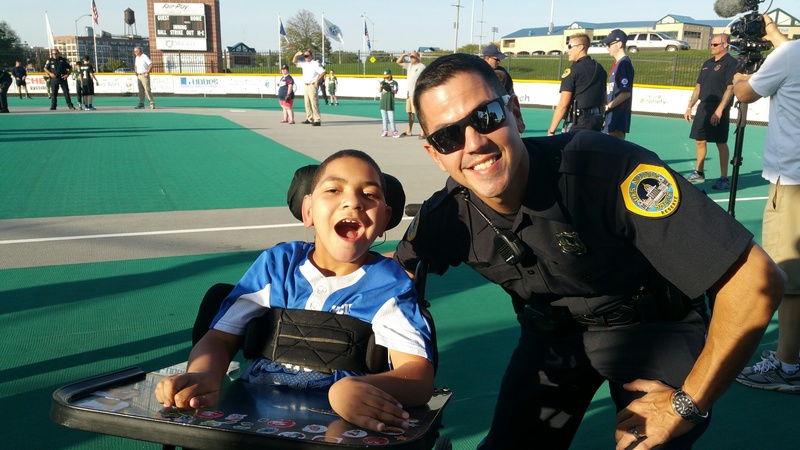 The Kiwanis Miracle League at Principal Park is a place where every player plays on a team–every player hits, every player gets on base, every player scores, and every player wins – every inning! Every player is matched with a “buddy” to help with hitting, catching, fielding, or throwing the ball, and to provide encouragement and assistance as needed. Kiwanis Miracle League Buddies are volunteers ranging in age from middle school (12) to senior citizens. Buddies provide safety first; they enthusiastically play baseball with their special player; and encourage the player to have fun! Buddies will receive a brief orientation, commit to the “Buddy Pledge”, and can receive community service credit. The specific duties of a Buddy are to act as an “Angel in the Outfield” to an assigned player. Each player will have different abilities and special needs. MANY thanks to the groups and individuals who served as Buddies for our exhibition season in 2008, and our spring and fall seasons in 2009 through 2018. 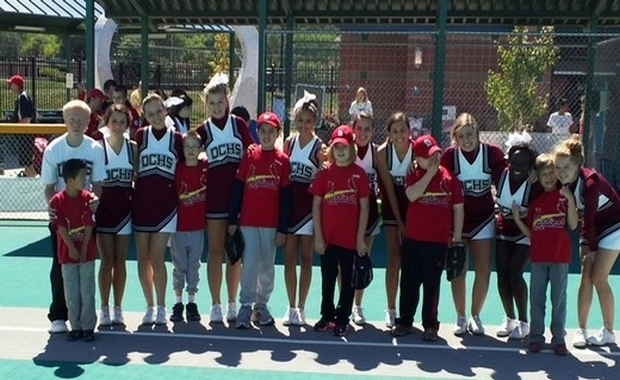 It takes many hands for these special kids to have a memorable experience at our ball park. Our 2018 Seasons are now history. Player online registration is now available for our 2019 Spring Season. Last year, our Spring/Summer season was challenged due to extreme heat conditions, causing us to cancel games many times. Let’s hope Mother Nature is a bit kinder to us in 2019! We hope you’ll consider joining us. Groups, such as church youth groups, HS athletic teams, companies, etc. are also welcome! Go to our home page and click on the orange volunteer button for steps to sign up for buddying. This is the ONLY way to register as a buddy. (NOTE: If you are having difficulty with the link, you may need to change browsers–e.g., AOL to Google Chrome). When you click this link, you will be asked for your email address. Please enter the email address you would like us to use to contact you about Kiwanis Miracle League opportunities/information. If you do not have an email address, please contact our Volunteer Coordinator (see below). With a click, you will be in the SignUp.com web site. 3. You’ll be able to view the various game times on all Saturdays in our spring and fall seasons and sign up to buddy for whatever times fit your schedule. You can sign up for one hour-long game or multiple games, on the same day or varying dates. Be sure to provide your cell phone number in the event we cancel a game, due to bad weather, e.g. 4. Download the volunteer and release forms from this web site (read further down on this page), download, complete, and fax to 515.457.7694; or PDF and email to burchhr@aol.com. If you completed a volunteer form for a previous season, you will need to complete another for 2019. If you complete a 2019 form for the Spring Season, you won’t need to complete an additional form for the Fall Season. 5. If you are signing up via signup.com, you will see that our waiver/release form has been built into the signup.com system. You do not need to complete a separate form/waiver. 6. SignUp.com will send you an email reminder two days before your selected time. 7. Arrive at the site at least 15 minutes before game time to check in. 8. Wear your “Angel in the Outfield” t-shirt from last season/year if you’re a repeat buddy. (Or wear your organization’s logo shirt if you’re part of a group). Donations are always welcome for your Angel shirt. 9. If you have questions, please contact our Volunteer Coordinator, Jan Burch at 515.457.7691 or burchhr@aol.com. If you are part of a group, please have your coordinator contact Jan directly before registering your group.